Saturday greetings to you! 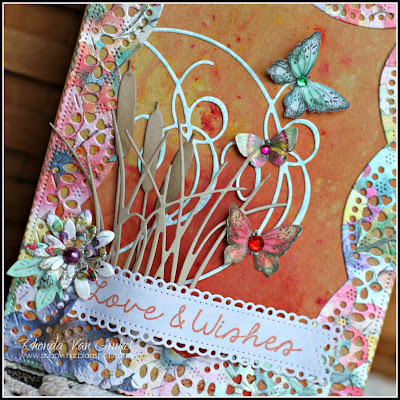 It's Rhonda Van Ginkel here today to host the blog for you and share my second set of projects with the C'est Magnifique August 2015 Card Kit. For my first project I wanted to create a tag or a card to fit the 5.75"x8.75" Off-White Envelope that comes with the kit. You get three. 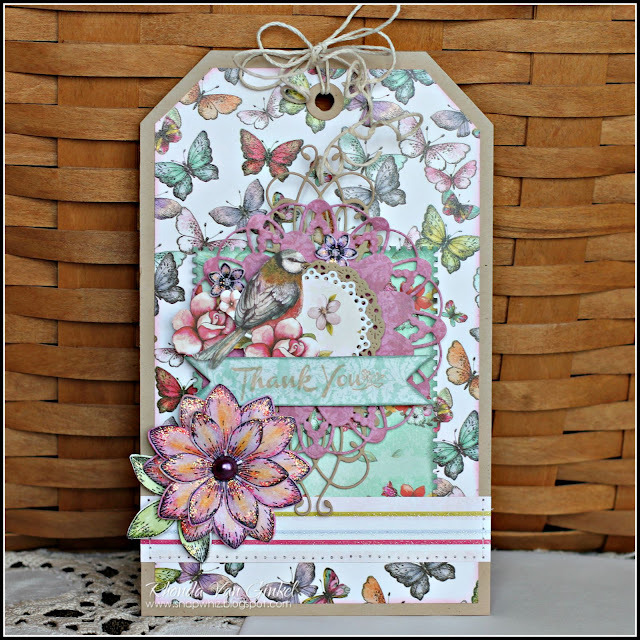 The design here includes a small open edge pocket on the bottom that you could tuck a gift card into - perfect for thanking that new teacher for your child. 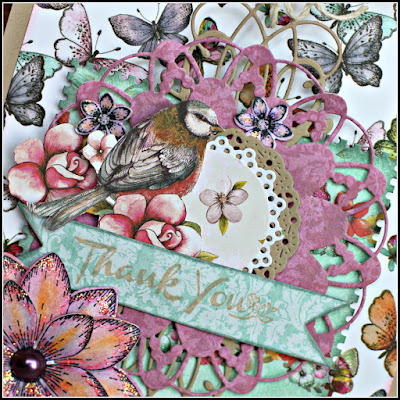 I've used the pretty coordinating "Thank You" sentiment stamp here with some fussy cut flowers and bird from the pattern papers. A few layers of delicate doily die-cuts provided the perfect perching spot for my bird. The pink and orange flower in the left corner was created using white cardstock, then colored to coordinate with the color scheme using watercolor pencils. I liked the idea that this can be put up on a bulletin board on display for a teacher's room as a reminder of our appreciation. 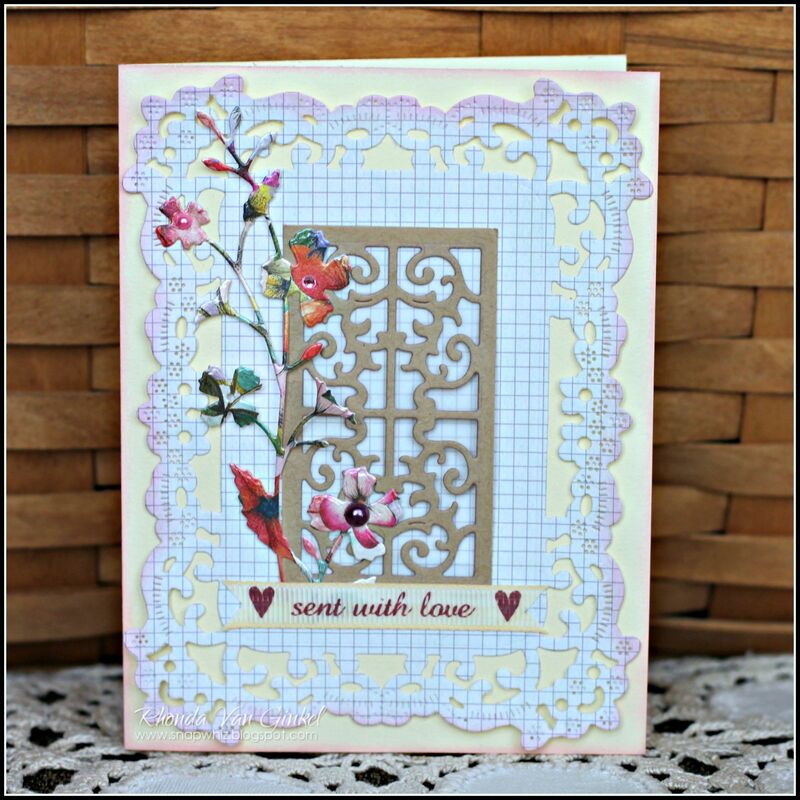 One of the really fun items in this kit is the sentiment ribbon, it's sweet and versatile. 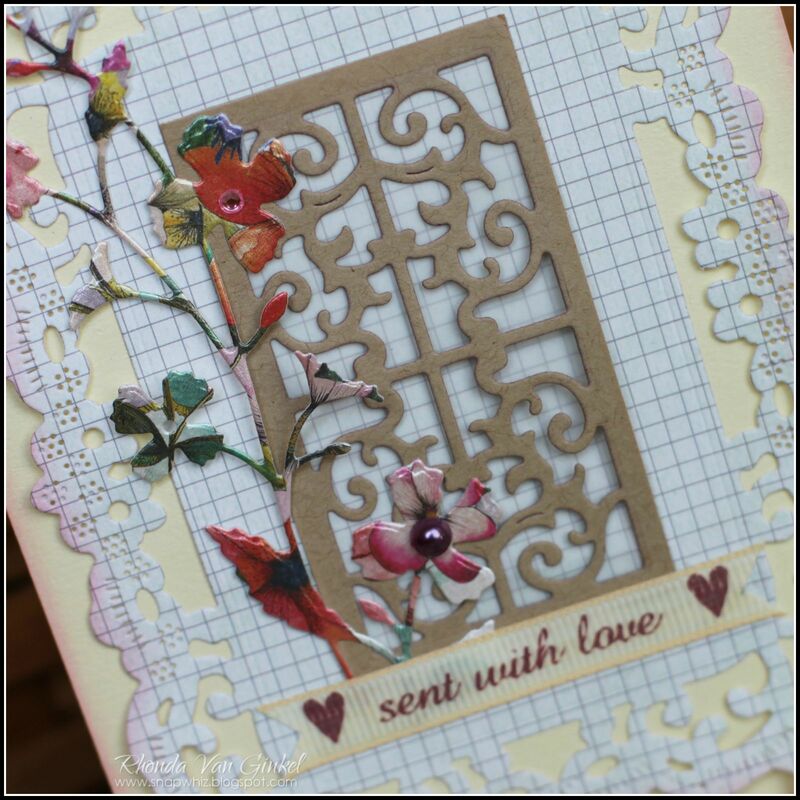 My roll is red on white, so I took some Antique Linen chalk ink and tinted to match my cream card stock. This fits the 4.375"x5.75" Cream Envelope provided in the kit. 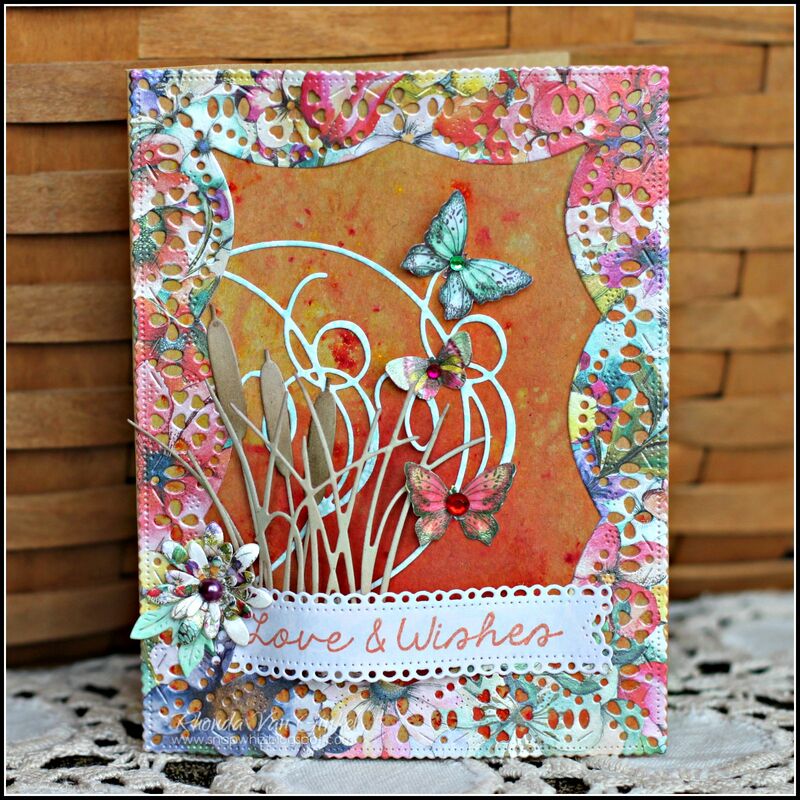 I love the elegant finish of the papers and used the bright vibrant floral paper here for the floral die-cut and let it be the focal point with the sentiment. For my final project I chose to combine the elegant finish paper with a kraft card stock base that I first spritzed with water, then added a bit of Colorburst in Orange, Lemon Yellow and Crimson. It coordinated so nicely in combination with the papers in this kit! The butterflies are so gorgeous, I had to cut a few of them out. The sentiment here is another from the kit. So so versatile! A few cattails and reeds in plain kraft paper provided a bit of scenery. You can also see how the pattern papers also make gorgeous florals too. 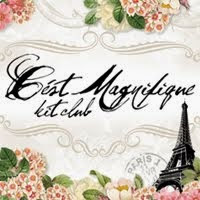 Be sure to check out the C'est Magnifique Store to get your very own August 2015 Card Kit today! Thank you so much for having me back again as a Guest Designer - it's always a treat designing with these gorgeous kits!